Because we often can’t use lawn sprinklers where I live due to water shortages, most of the grass dies by mid-June. I’ve started reclaiming marginalized portions of our lawn with some new gardens. I’m trying to install draught-tolerant plants without going to the extreme of the total xeriscaping. I love the idea and techniques in xeriscaping, I just don’t love the look of rocks as an entrance to our heritage home. A more traditional garden seems more appropriate for our setting. The question is, how do I get these gardens to survive the first few years? We are often away and I’m not always able to find someone to water our plants. It’s also kind of a pain to water plants all around the yard. I feel like a bad plant mom when I can’t get out there for a few days. I knew I wanted something that was extremely water-efficient, yet cost-effective in terms of materials. I also wanted it to blend in with the garden so as not to take away from the plants themselves. Last year my parents received a landscaping quote which included an irrigation system similar to what we would need. The irrigation portion of the quote came to a total of $6800! We definitely don’t have a spare $6800 hanging around, so we decided to tackle the job ourselves. How hard could it be? Turns out…not that hard. DIY irrigation systems aren’t nearly as tricky as I thought. We made a few mistakes at the store trying to pick things out, and I’m sure a professional would have done the install to a higher level of quality, but overall I was very pleased with the finished system. Our system cost us $500 for an automated system that covers all of our flower gardens, perennial beds, and annual vegetable garden. I’m pretty darn happy with it. The emitter and solid hose (blank) irrigation tubing was easy to find at the local hardware store. 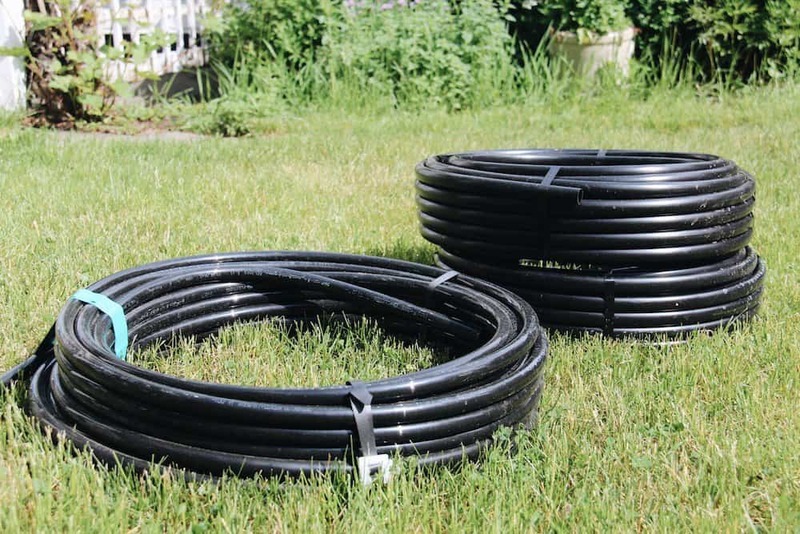 I’ve used both the black generic irrigation tubing and the name-brand copper Rain Bird irrigation tubing. Both work well, just be sure to purchase connections that match the tubing you’ve purchased as the fit can vary between brands. I find it’s easiest to test the connections with the tubing in the store before buying to make sure everything works smoothly at home. Lawn sprinklers are not allowed in our town during the months that plants really need a bit of extra water. Drip irrigation systems are very water-efficient. Very little water is lost to evaporation, unlike overhead sprinkler systems. Drip irrigation puts the water right at the base of the plant rather than watering the leaves. This minimizes moisture-related problems on plant leaves. The materials were easy to find locally at Costco, our local hardware store, and a local irrigation supplier. We had to return a few connections (we bought too many), so local availability was a bonus. The materials were cost effective. For our configuration, we were able to lay 500 feet of drip emitter line from 3 outdoor outlets across 6 gardens for $500 CAD. The line is heavy duty and will last a long time, yet it was relatively easy to work with using tools we already had. I know that it will last because we have the same tubing in one of our old gardens. It was installed 15 years ago and is still working. The components for installing DIY drip installation are interchangeable, making a custom line arrangement simple. 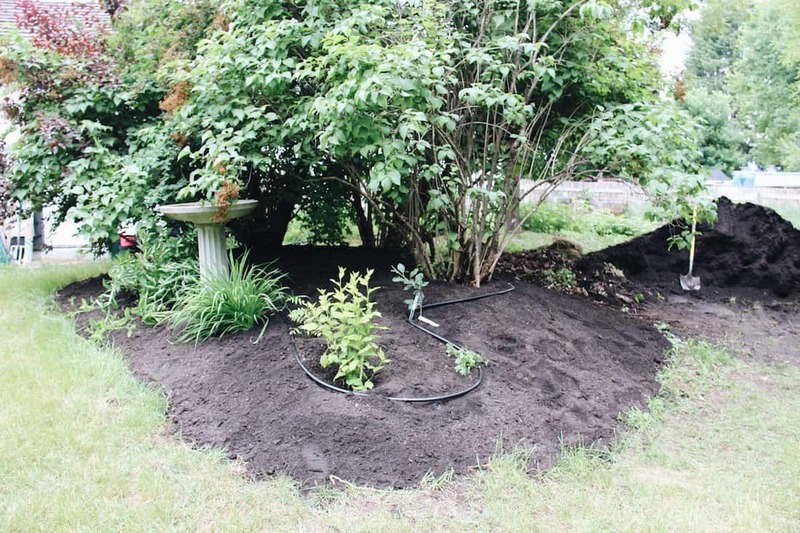 The hoses are brown or black, meaning that the hose will blend in with the topsoil. I do plan to mulch over the hoses eventually, but i’d like to ensure the plants are established before I do that. Having everything blend during this transition period is a nice touch. Sketch out the area using the paper and pencil. Draw a rough perimeter of the garden, the water spigot, and any other important features (fences, walkways). Sketch in imaginary drip lines where you envision your lines going. Make sure to pass the line close by existing plants or areas in which you plan to install new plants. Draw drip emitter line (line with holes in it) wherever you have plants that require water. 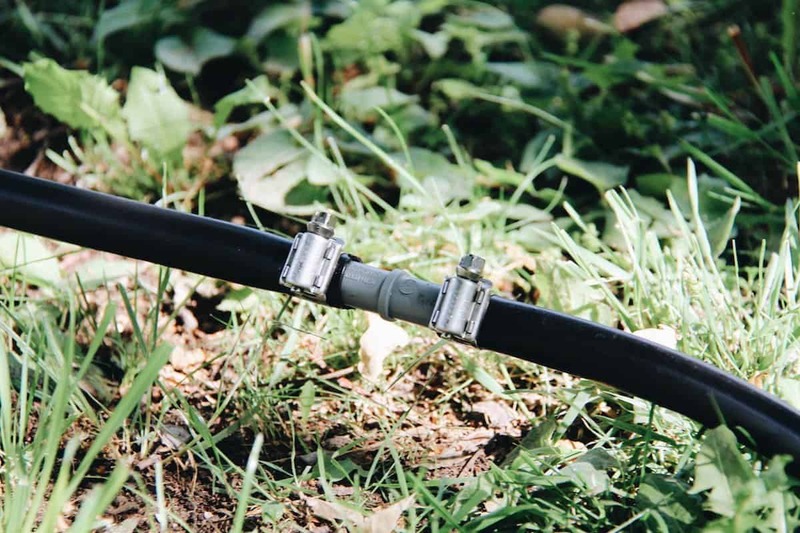 Draw solid/blank hose line to connect the drip emitter line from the garden to the water tap. You don’t want drip line with holes in it coming immediately out of the water spigot as it will create a muddy mess by your water outlet. Measure the garden area. Add the measurements to your drawing. Also measure the desired drip line lengths as best as you can. Wrap the tape around the garden as if it were the line. If this is too fussy, just loop the tape around the garden leaving lots of space, and take that measurement. When you have the actual emitter line, winding the hose through the plants will take up the extra line. Update your sketch to include any changes. Calculate the total length of required emitter line and solid line that you’ll need for your irrigation system design. Plan to buy 5-10% more line than you’ll need (of each type). Calculate the type and number of connectors and collars required for your desired configuration. If it isn’t obvious what you’ll need, go back to your drawing. Make sure you’ve sketched out exactly where the emitter line will go, and then where the solid line will go. How many emitter lines come out of the solid line? Ask yourself what each connection will have to look like. Each time you connect a line to a connector, you’ll need a collar to hold the line onto the connection. For instance, a T-shaped connector has 3 lines going into it and would therefore require 3 metal collars (see photo above). It can be a bit tricky to imagine. If you can’t picture it, just buy a few of each type (T, Elbow, Straight), and then return what you don’t use. If you’ve ever wanted to lay landscaping fabric or add more topsoil to the garden, now is the time. Trying to add fabric or soil under the lines is a challenge (I know from experience…). 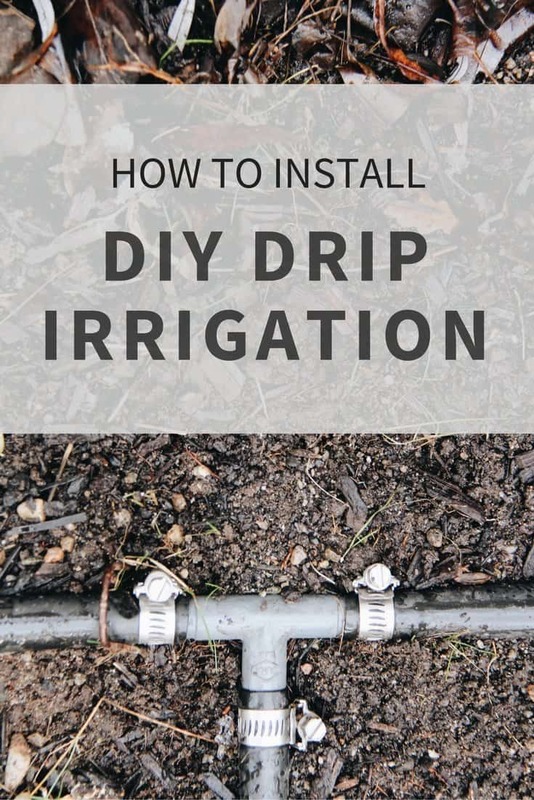 If this is on your mind, do it now (before you install your DIY drip irrigation lines on top of your garden bed). Purchase your supplies. Keep the receipt in case there is an extra T-connector or two hanging around when you’re done (again, I know from experience). Set up the watering timers for your desired time. Check your bylaws for the hours in which watering is allowed. Early morning, such as 3-5 AM, is generally a good pick. 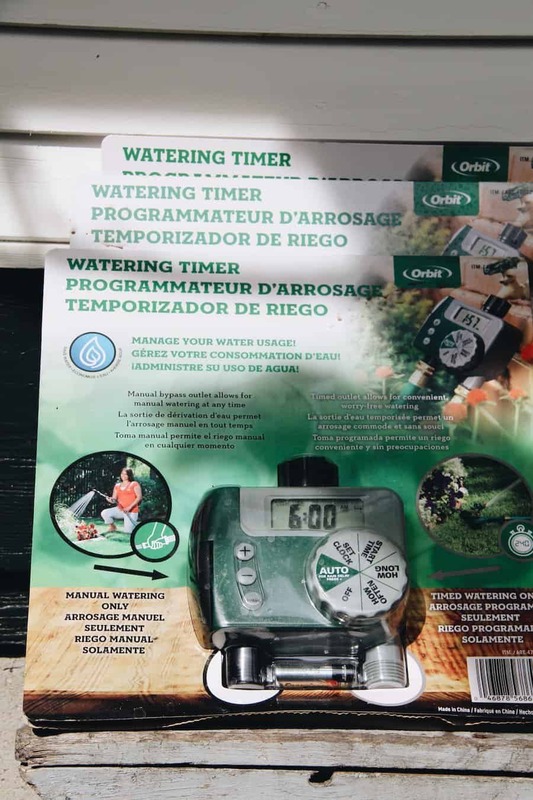 Attach the watering timer(s) to the water outlet(s). Make sure the tap is set to off before/during/after attaching it. Lay out the solid/blank line from the water outlet to the garden. Lay out the emitter line around or beside the garden. Envision how the line will weave through the garden, but keep line in large loop around/beside the garden for now. You’ll put it in it’s permanent place after the connections are done. Once you’re sure you have enough line, use the garden shears or a tubing cutter to cut the solid and emitter tubing to the desired lengths. Leave a little extra on each unless you are 100% confident in your measurements and ability to install connections. Place metal connector collars around all the tubing ends. Push the tubing connector into the cut ends of the hoses. Slide the metal collars up onto the portion of the tubing which is on the connector. Use the drill to tighten the collars onto the tubing. Install the hose connector on the end of the solid line that will go into the water outlet. Connect the hose connector to the watering timer. Use the timer’s manual setting to “pressure test” the system. Turn on the irrigation system and walk the length of the line. Pay special attention to connections. If you notice a connection that is leaking, tighten the collar. If that doesn’t fix the connection, turn off the water and replace the connection. Once you’re sure the system is working as intended, place the line up into the garden in the permanent location. Use the landscape staples to hold the line in place. Not so hard at all! If you’ve tried installing your own DIY drip irrigation or automating your garden watering, share any helpful details in the comments below! So cool ! I love this, Pinned ! Sorry to hear that! And that’s definitely a good question. We were lucky to have easy access to well-priced supplies, as well as the time to complete the project. If you’re in an area with reasonable installation rates and you don’t have the time to do it yourself, getting someone to fix it for you may make a lot of sense. Good luck with your system, and thanks for stopping by!